We had done a bit of painting with and chasing magnets a few days back so I decided to explore some more. I already had colored rice and beans in his sensory bin so the rest took about ten minutes to set up. I cut up little hearts and fishes from colored paper, put a paperclip on each of them and mixed them up in his red rice tub. For the fishing stick, I tied one end of a piece of yarn to a stick and one end to a magnet. As the clips got attracted to and stuck on the magnet, he fished them out one by one! For my post on Magnets: Introducing, Painting and Chasing, click here. For my post on What's in our Sensory Bins and How I Color rice, click here. oh this would be fun :) I did a fishing game where I made fish shapes in felt. This would have been so much easier! pinned! Felt makes sense! I made them from origami paper that was right in front of my eyes! LOVE this… it might need to be in my sensory bin this week! 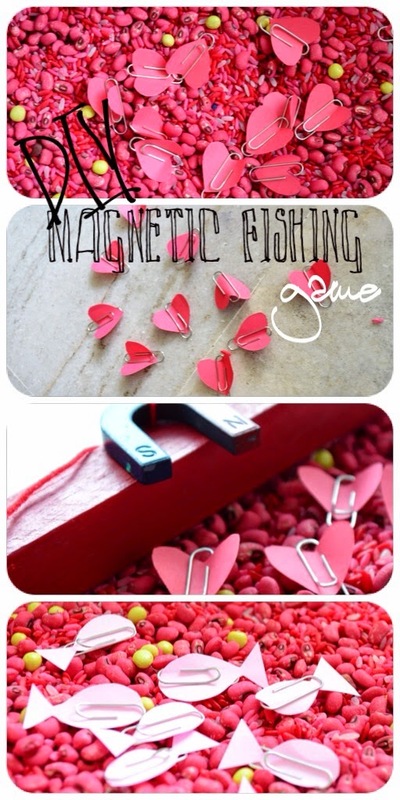 Your magnetic fishing game is great. I bet it will keep kids bury for hours. Thank you for sharing with the Clever Chicks Blog Hop! I hope you’ll join us again next week! My daughter would love this. What a could way to help them practice eye hand coordination. Love this! I'm going to find a magnet ASAP! Pinning. What a great idea! Just by changing the cut-out shapes this will work for any time of year. I am also going to pop over and see how you colored the beans and rice, Too clever! Thanks for sharing. This is so cute! Thanks so much for joining us at the #HomeMattersParty - we hope to see you again next week! This would be a lot of fun for my kids! Thank you lovely ladies for your encouraging comments! How fun and colourful! I loved that were able to re-use what you already had around. Thanks for linking up with Mom's Library, I'll be featuring you this week at Castle View Academy. Happy Valentine's Day! I have played this game with kids before and it is super fun! Never thought of fishing for hearts. Great Valentines Day activity! Thanks for sharing with SYC. I love this!! Such a cute Valentine's idea! Would love to see you at my craft party which is new Thursdays at 7pm EST. I pin every instruction post! Have a great rest of the week! What a fun motor control activity. Thanks for sharing on the #HomeMattersParty I hope you will join us again next week. Too cute. I love how easy it is to make. Thanks for linking up at the Bloggers Spotlight. This is great! What a creative idea. Thank you for joining the Learn & Play Link Up! You were featured on Christian Montessori Network this week. What an adorable game. Thanks for sharing at the #LMMLinkup. So pretty and a perfect valentine's craft for little ones. We often play the fishing game using bracken leaves as fish and sticky weed as a rod, same effect as the bracken sticks to the sticky weed, except you can only do it in summer! This is a great winter alternative.